A “Just Married” sign paired with the bride a groom makes for a really fun wedding photo. 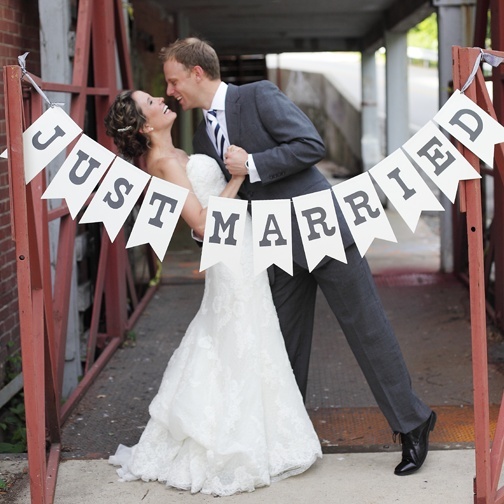 For a while, send offs and “Just Married” signs disappeared, but these signs are making a comeback in the wedding scene. Today, we find couples incorporating unique “Just Married” signs in their weddings that add a personal touch to wedding photos on their big day. Even if they don’t plan to hang a “Just Married” photo up in their home, many brides and grooms are opting to use these photos for Thank You Cards. 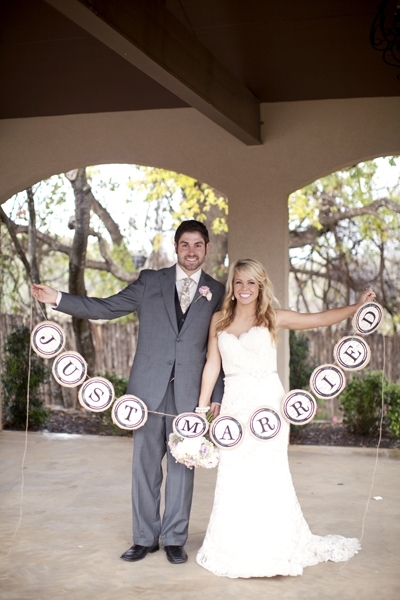 Whether the bride a groom choose to hold (see above) the sign or hang it up (see below), “Just Married” streamers bring a romantic old-fashioned feel to a modern wedding. A simple painted wooden sign, like the one below, displays the date of the wedding. This may be a good option for the bride or groom who has the tendency to forget anniversary dates. 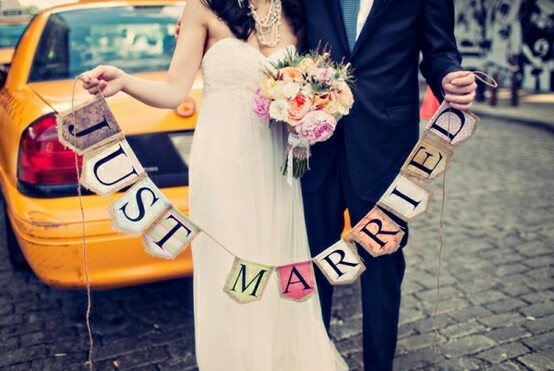 For something simple with a touch of regality, a “Just Married” banner, like the one below, may be the way to go. What’s even more special about this photo is that it was taken on the steps outside of the church, and captures the bride and groom just minutes after they were married. 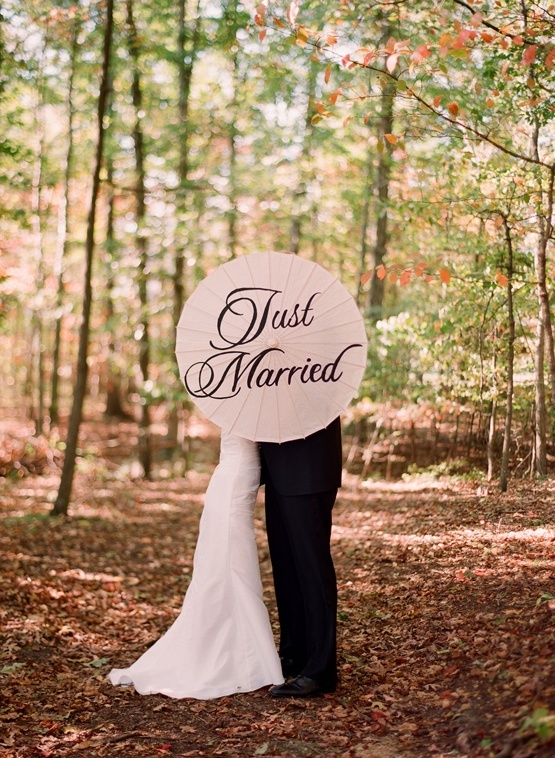 For the bride and groom that need a little more privacy (or are just a bit camera-shy), a fun way to announce your new marriage may be to hide behind with the words displayed on an umbrella. With this option, you let the words to the talking. The bride and groom in the next photo incorporated their entire wedding party in their “Just Married” photo. This is a fun way of allowing more people to join in the photo to announce the big news, and it makes for a unique bridal party picture. Vintage cars are a hot wedding trend as brides and grooms pick the vehicle that will carry them away to honeymoon bliss. 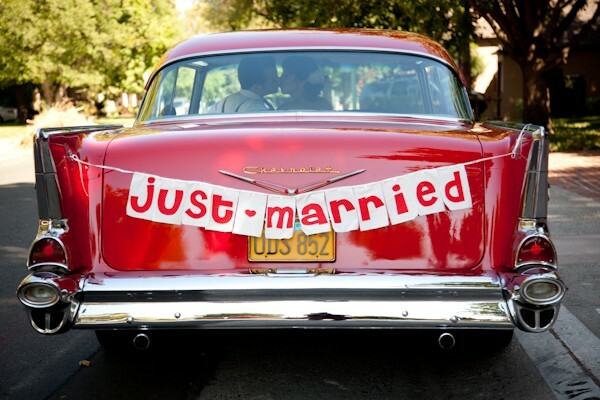 A simple “Just Married” sign attached to the back of the vehicle gives the newlywed getaway car the right touch and a vintage-chic look. There are hundreds of ways brides and grooms are asking us to incorporate “Just Married” signs into their wedding photos. The best option is to choose one that best reflects your personalities.